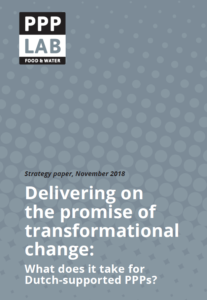 This paper presents the main lessons from Dutch-supported public–private partnerships (PPPs) in food security and water, based on four years of research by PPPLab. It provides building blocks for making PPPs deliver on the Sustainable Development Goals (SDGs), with fundamental implications for key partners in PPPs and policymakers, both from the Netherlands and from other countries that share the SDG ambitions. Partnerships are expected to address complex issues in challenging places. PPPLab found that Dutch-supported PPPs do rather well when it comes to pioneering innovative approaches, aligning interests, influencing the rules of the game, leveraging actors’ strengths and developing inclusive partnerships. However, the partnerships have to deal with high expectations from all sides. rethink risk and combine resources.